As east-central Scotland's Local Coastal Partnership, the Tay Estuary Forum puts together a conference each year to reflect current issues within the coastal and marine environments at both a regional and national scale, with a Tay regional focus, attracting key stakeholders working within the Fife, Angus, Dundee and Perth & Kinross coastlines, and the adjacent offshore area. The TEF aims to incorporate elements of science, policy and management beneath an overarching theme, to give a variety of participants a platform to discuss and inform. 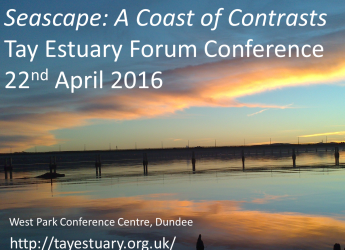 Please register by 15th April 2016 via the Tay Estuary Forum website or by post: Tay Estuary Forum, G35, Tower Building, University of Dundee DD1 4HN, email TayEstuaryForum@dundee.ac.uk, phone 01382 384933. Refreshments and a buffet lunch will be offered; there is a discount available for postgraduate students.